Tullamore’s Stuart Grehan birdied two of his last three holes for a second round 69 and the biggest halfway lead in the CityNorth Hotel sponsored East of Ireland Amateur Open for eight years. 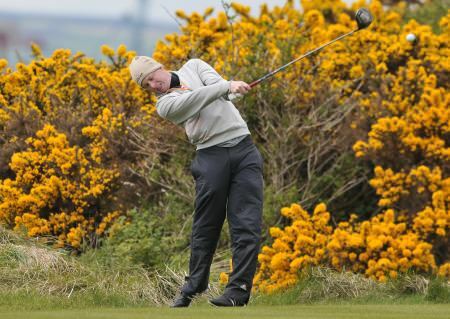 The 22-year old Maynooth University star led by a stroke overnight at County Louth thanks to a superb 67 on Saturday. But he was equally impressive yesterday as he mixed six birdies with three bogeys to head the qualifiers by six strokes on eight under par from reigning Irish Amateur Close champion John-Ross Galbraith. Winner of the Close at nearby Seapoint last year, Whitehead player Galbraith posted a second successive 71 to sit alone in second place on two under par with Castle’s Alex Gleeson the only other player in red figures, a shot further back on one-under par after rounds of 72 and 71. Belvoir Park’s Gareth Lappin (72), Warrenpoint’s Jamie Fletcher (73), Galway Bay’s Eddie McCormack (74) and Knock’s Colin Fairweather (76) were tied for fourth on level par. But the star of the show was Grehan, whose six-shot lead is the biggest since eventual champion Richard Kilpatrick led by six strokes from Shane Lowry and Pat Murray in 2007. A quarter-finalist in the Irish Close at Seapoint last year, where he led the strokeplay qualifiers, Grehan turned in level par 37 as he birdied the par-five second and sixth and the tricky eighth but bogeyed the fourth, the tough, par-three fifth and the testing ninth. However, he was immaculate on the homeward nine, racing home in 32 thanks to birdies at the 10th, 16th and remodelled, par-five 18th. The cut for the leading 51 players fell at eight over par 152 which meant a disappointing title defence for last year’s winner Colm Campbell from Warrenpoint, who added a 74 to an opening 80 to miss out by two strokes. Galbraith made his debut for Ireland in winning Home Internationals team last year and while has struggled to hit top for so far this year, he’s clearly at home in County Louth. An impressive winner of the Close last season,his controlled style of play clearly suits Baltray and after birdies at the third and sixth he followed bogeys at the 13th and 14th with a two at the 15th for his second successive 71. WD 75 Gary McGrane (The Royal Dublin) 75 WD, Timothy Jordan (Dungannon) 78 WD, John Conroy (Bray) 80 WD, Greg O’Mahony (Fota Island) 79 WD, Alan Fahy (Bray) 79 WD, Shane McGlynn (Carton House) 81 WD, Niall Foley (The Island) 81 WD, Jonathan Gourley (Shandon Park) 82 WD, Conor Ryan (Dun Laoghaire) 82 WD. Tullamore's Stuart Grehan posted a four over 76 in tough morning conditions to take a five shot lead in this afternoon's final round of the CityNorth Hotel sponsored East of Ireland Amateur Open at County Louth. Tullamore's Stuart Grehan hit six birdies in a five under par 67 to take one-stroke lead after the opening round of the CityNorth Hotel sponsored East Of Ireland Amateur Open Championship in Baltray. Even veterans like two-time winner Declan Branigan agreed that the right decision had been made after torrential rain and southerly winds forecast to gust over 100kph, reduced to the CityNorth Hotel sponsored East of Ireland Amateur Open to 54 holes for the first time in its 75-year history. Simon Ward during the Irish Amateur Open at Royal Dublin last month. Picture Pat CashmanBaltray’s Simon Ward set the early pace at the halfway stage of the weather-delayed East of Ireland Amateur Open at Co Louth.